HANOI (AFP) – Vietnam marked 50 years since the audacious Tet Offensive on Wednesday, in a bittersweet ceremony featuring patriotic dance performances recalling the attacks that changed the course of the Vietnam War. The surprise military offensive in 1968 — launched by the communist north on the eve of the Tet lunar new year — targeted more than 100 cities and outposts in southern Vietnam. The assault eventually prompted the US to withdraw from the bloody war, though at the time it was a military disaster for Hanoi which lost an estimated 58,000 fighters. On Wednesday entertainers dressed as soldiers and peasants took to the stage at an official ceremony in Ho Chi Minh City, followed by a string of performances from flag-bearing dancers and martial arts performers in red and gold. Some war vets attending the event recalled the thrill of hard-fought battle, followed by the heartache of losing fellow fighters. “We resisted the enemy until we had no bullets, we left our guns and retreated,” Nguyen Van Duoc, 75, told AFP, adding that the remains of eight comrades who died in the battle have never been found. The Tet Offensive is remembered with mixed emotions in Vietnam — especially among former southern soldiers who don’t agree with Hanoi’s narrative of events. But officials glossed over the darker aspects of the war at Wednesday’s ceremony, remembering the campaign as a heroic sacrifice. “The 1968 spring general offensive will forever be a bright symbol of patriotism, strong determination, and the party, people and military’s willingness to fight for independence and freedom,” said HCMC party leader Nguyen Thien Nhan. 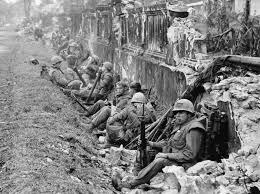 More than 80,000 northern soldiers and Viet Cong fighters participated in the January 1968 coordinated attacks, including in major cities Hue and Ho Chi Minh City, formerly the southern capital of Saigon. Although the US and their South Vietnam allies eventually beat back their communist enemies, the offensive electrified the anti-war movement in the US and persuaded politicians to pull out years later. The Vietnam War, known as the American War among Vietnamese, killed an estimated 2.5 million northern fighters and 58,000 American servicemen, along with some three million civilians. The bodies of an estimated 300,000 Vietnamese soldiers are still missing, and government efforts to recover them have been slow. Some families hire psychics or private investigators to locate their lost loved ones in order to perform traditional burial and worship rites. Fellow vet Nguyen Van Tau said the fighters who have never been recovered deserve special recognition. “Many of them are gone forever but their bodies have never been found… they lived, fought and sacrificed their lives for the nation,” he said, recalling the “cold forests” and battlefields where they fought.